For what is essentially little more than a fun, tossed-off sidestep of several more high-profile projects, Monday night’s performance at The Independent nevertheless proved Mister Heavenly to be a unique and welcome addition to its members’ collective resume. 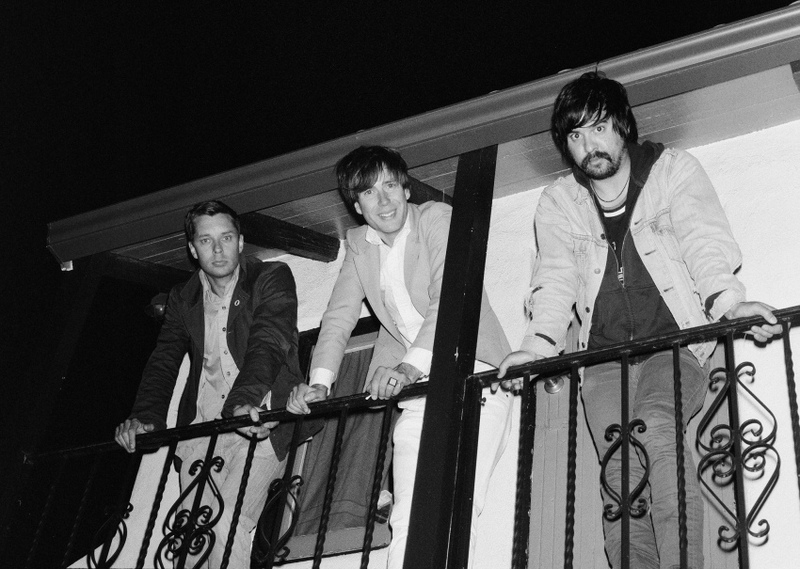 Comprised of Ryan Kattner (aka Honus Honus of Man Man), Nick Thorburn (Islands, The Unicorns) and Joe Plummer (Modest Mouse), the trio played a short but sweet set of 1950s-tinged indie rock that lived up to its self-described “doom-wop” sound. Fresh off the release of Out of Love, its Sub Pop-released debut, it came as little surprise that the group’s set played out like a shuffled version of that album’s track list. A standout came early in the form of the eponymous “Mister Heavenly,” a track that perhaps best showcased the sweet and sour dynamic between Thorburn’s syrupy croon and Kattner’s sandpaper-wrapped rasp. Starting with a sparse synth bass-driven verse, the track built to a couple of propulsive choruses before giving way to a dreamy outro section full of more than a few nods to classic 1950s AM radio. The lively tom rolls and quirky melody of “Pineapple Girl” quickly turned it into a crowd favorite, inciting some movement from what was by all accounts an appreciative but low-key audience. Elsewhere, the jumpy piano of “Charlyne” proved to be a perfect pop vehicle to showcase the surprising emotional range of Kattner’s gruff voice, while “Harm You” spotlighted Thorburn’s higher-pitched, deliberately drawn-out vocal phrasings. While the band certainly could have benefited from having a bass player onstage (a role that actor Michael Cera fulfilled during its last touring stint), the frequent lack of a significant low end ultimately didn’t prove to be too much of a distraction. A ton of credit for this has to be given to Plummer, whose tactful drumming and percussion didn’t falter once and often added creative arrangements to Kattner and Thorburn’s keyboard and guitar setup. For an encore, Thornburn first led the band in a curious rendition of Cody Chesnutt’s “Look Good in Leather,” which I’m pretty sure didn’t make quite the impact it was intended to. The song’s boastful tone proved to be an awkward fit, which might be fine if the group did something unique with it. Instead, Mister Heavenly played it straight, leaving me wondering what exactly sparked the motivation to cover it in the first place. Luckily, the stomping rhythms of “Bronx Sniper” quickly took over, as the denim-clad Kattner hovered over his keyboard delivering his most intense and engaged vocal performance of the night. It was a fantastic end to a show that left me hoping these guys might somehow find a way to stick together despite the demands of their individual projects.